“Deep Ellum Blues” has become a standard blues song, warning of/extolling the vices found in the once-thriving, predominantly black area of town, where a lot of people — black and white — enjoyed themselves (after dark) in clubs and bars, immersed in the sometimes shady goings-on that one tends to find on the other side of the tracks. The song (sometimes irritatingly called “Deep Elem Blues”) was first recorded in 1935 by the Lone Star Cowboys (popular performers in the Dallas area, better known as the Shelton Brothers). And now it’s become a blues standard, sung around the world by people who have no idea what a “Deep Ellum” is. Below, the original version by the Lone Star Cowboys, who later changed their name to The Shelton Brothers and were well-known to Dallas audiences through their regular appearances at the Big D Jamboree and on local radio (in a video conveniently uploaded just this week!). My personal favorite, this hopping western-swing-big-band-rock-n-roll version by the always fabulous one-time Dallas resident Hank Thompson. I can’t leave off this turbo-charged rockabilly version by Dallas’ own “Groovey” Joe Poovey! And, finally, for good measure, one weird version, by the always reliable Charlie Feathers. Remember y’all: KEEP YOUR MONEY IN YOUR SHOE! 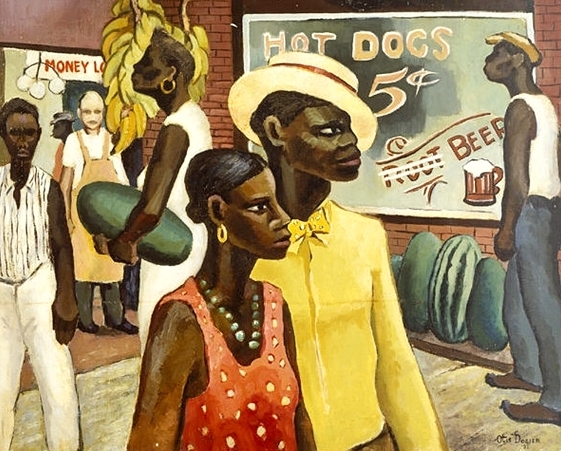 “Deep Elm” painting by Otis Dozier (1932) — one of the Dallas Nine group — from the collection of the Dallas Museum of Art. “Deep Ellum” film by Alan Govenar, one of Dallas’ leading blues and cultural historians and archivists. For more on the 1985 short film, see the FolkStreams site here. For Alan Govenar’s Documentary Arts website, see here. For more on the history of Deep Ellum, I highly recommend Deep Ellum and Central Track, Where the Black and White Worlds of Dallas Converged by Alan B. Govenar and Jay F. Brakefield (Denton: UNT Press, 1998), as well as their recent revised/expanded book Deep Ellum, The Other Side of Dallas (College Station: Texas A & M University Press, 2013). Govenar and Brakefield have written the definitive history of Deep Ellum in these two volumes. You can read a bit about the song from the latter book here. I wrote about another interesting song, “Dallas Blues” — considered by many to be the first blues song ever published — in the post “I’ve Got the Dallas Blues and Main Street Heart Disease,” here. No love for what was a Grateful Dead/Jerry Garcia staple? Ha! Well, I was trying to keep it Texas-related (with a Charlie Feathers cameo) and vintage-y, but I realize that a lot of people know the song because of the version by the Grateful Dead. Thanks, Michael! Not a problem. This Fort Worth boy enjoys your blog quite a bit. Keep up the great work. Thank you, Michael! I’m a big fan of FW — I may detour the blog in that direction occasionally….